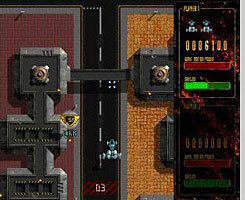 Deimos Rising was released for MacOS and Mac OS X in December 2001. We've found that many people are interested in how the game was made, so whether you're a game player or interested in making your own games, we'll try to shed some light on the process. Swoop Software is a husband and wife team. We somehow manage to fit ourselves into one small office along with two desks, two cats (one with a penchant for other people's coffee) and too many computers. We live in the suburbs of Adelaide, South Australia. Deimos is our fourth game, following on from Swoop, Bubble Trouble (co-developed with Alex Metcalf in Wales) and Mars Rising. Each of these games has been published by Ambrosia Software, of Rochester, New York. Our aim is to make fun games with an emphasis on gameplay, designing them for average machines such as the iMac, rather than requiring the latest hardware or system software. After Mars Rising, we needed a break from shootemups and so started work on a new game called "Attack of the Flying Saucers" (AFS). Based on '50s sci-fi films such as "Forbidden Planet", it was similar in theme (though not gameplay or visuals) to Brian Greenstone's recent game "Otto Matic". 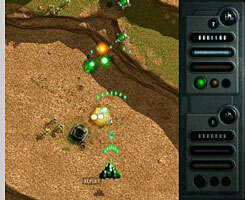 The design required us to develop some new technology, including a more flexible game engine and fully 16-bit graphics.